A movie theater in Brazil scared up some marketing fun with custom decals for the Disney Pixar film Monsters University. The theater created decals featuring cut-outs of the movie’s much-loved characters. The stickers, which were co-branded with the theater name and the movie itself, were designed to be placed over a vehicle’s headlights. The pieces were so subtle that drivers and their passengers may not have noticed them … until dusk fell. Then, in true Disney Pixar fashion, the magic happened. With the custom decals in place over the headlights, the Monsters University cast popped up wherever the light shone. Can you imagine kids’ reactions to monster figures lurking on their garage door as they pull up or shining from the dark yard beyond? It seems like a recipe for disaster. Until, of course, they realize it’s just Mike Wazowski, James P. Sullivan, and the other friendly pupil/monsters from Monsters U. 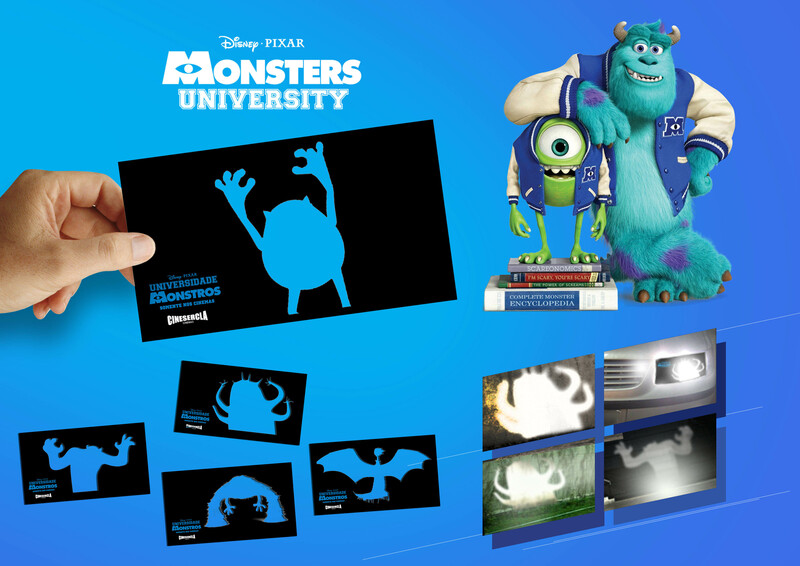 Then, the custom decals serve their purpose: Promote Monsters University and show fans that the dark isn’t so scary – monsters and all. Make your promotional decals stand out by making them reflective or even including a flashing light. Let our Brand Consultants show you all the ways to creatively use stickers and decals.